The Studeblogger: The Scotsman Rides Again. 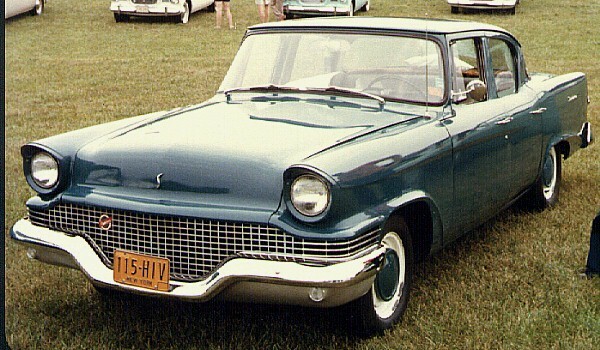 I was browsing Paul Niedermeyer's Curbside Classic site when I found a very well-written article on the Studebaker Scotsman, the low-priced base-price stripper that S-P fielded in 1957-1958 to try to gain a foothold with fleet sales and accounting firms. The Scotsman was the direct ancestor of my Standard, which was a return to familiar territory for the Corporation - take a regular offering and de-content it to meet a price point. The Scotsman was beautiful in its own way - a big car devoid of chrome, ornamentation or fancy paint jobs in a go-go Atomo-Powered era that was all about glitz and flamboyance. Without the distractions, the smoothness and beauty of the car's lines were easily apparent. And the ploy worked, as Jeff Nelson describes in his article - enough Scotsman cars and trucks were sold to enable the Corporation to field the Lark for 1959, an even bigger success that would give the company another half-decade of life.